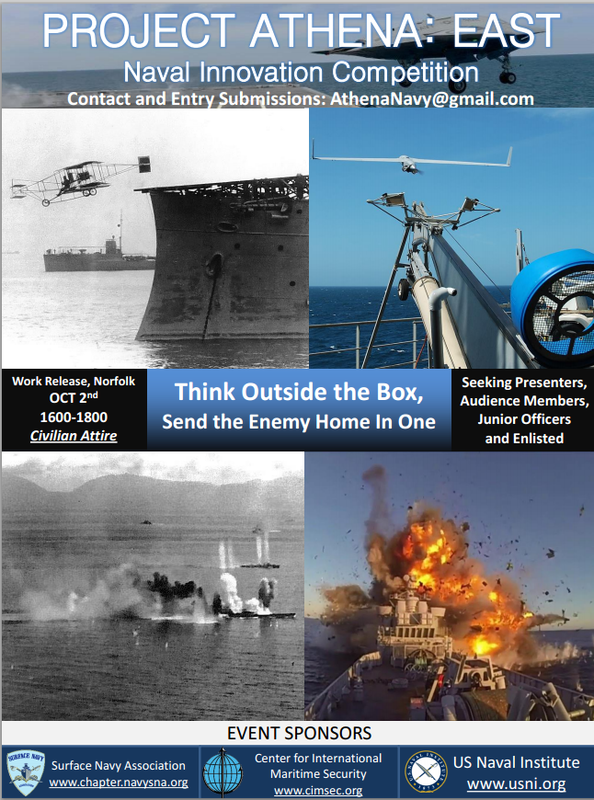 From new tools, maintenance processes, software, to new concepts in everything from administration to tactics… This event is to display and engage naval Innovation from the ranks of our institution, in and out of uniform. 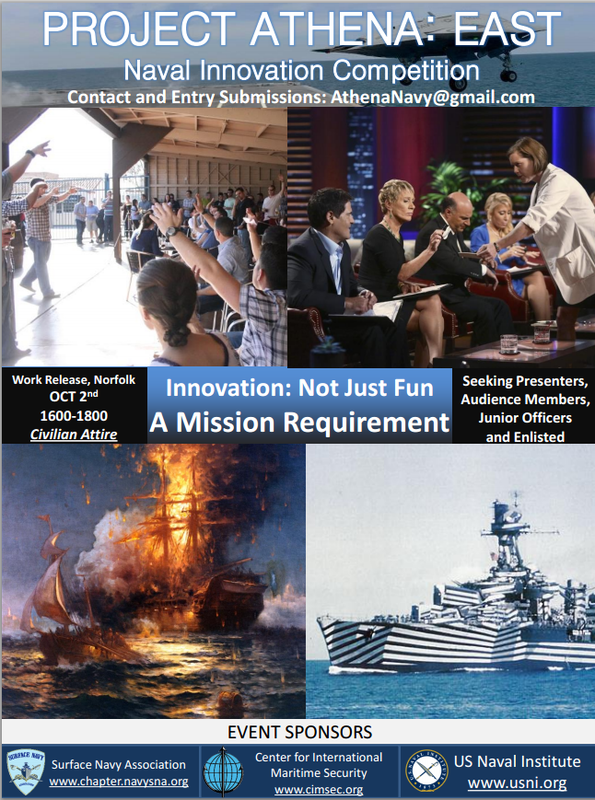 There are still plenty of tickets for audience members, and we are still taking idea submissions for the 5-6 innovators who will present to the assembled crowd and our “Shark Tank” board of naval leadership. 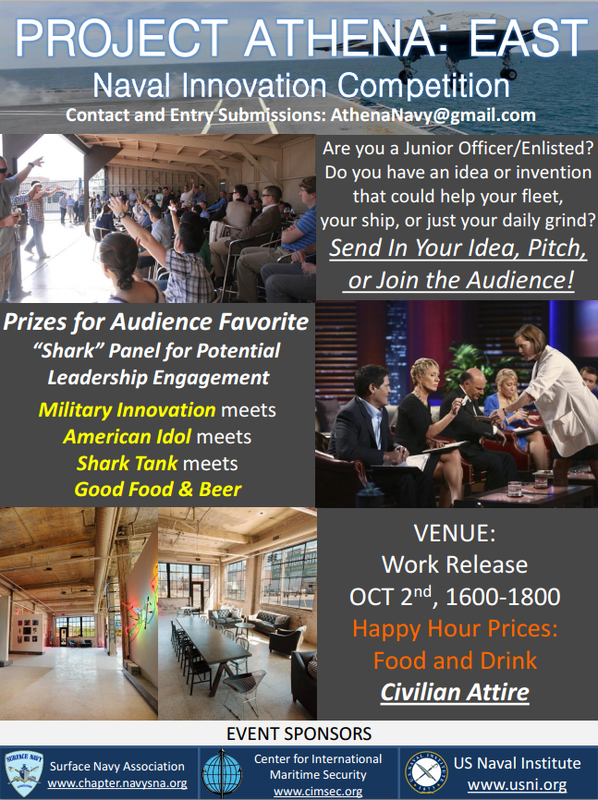 Send Presentation Submissions to AthenaNavy@gmail.com. Consolation Prizes: 1 Semester of Improv 101 at the Push Comedy Theater in the Norfolk. However, the real “so what” (aside from the good company, good food, and good drink) is the opportunity to present your ideas to the folks who can potentially implement it, namely our “Shark Tank” Board. -Professor Jennifer Michaeli: Director of ODU’s Naval Engineering and Marine Systems Inst. 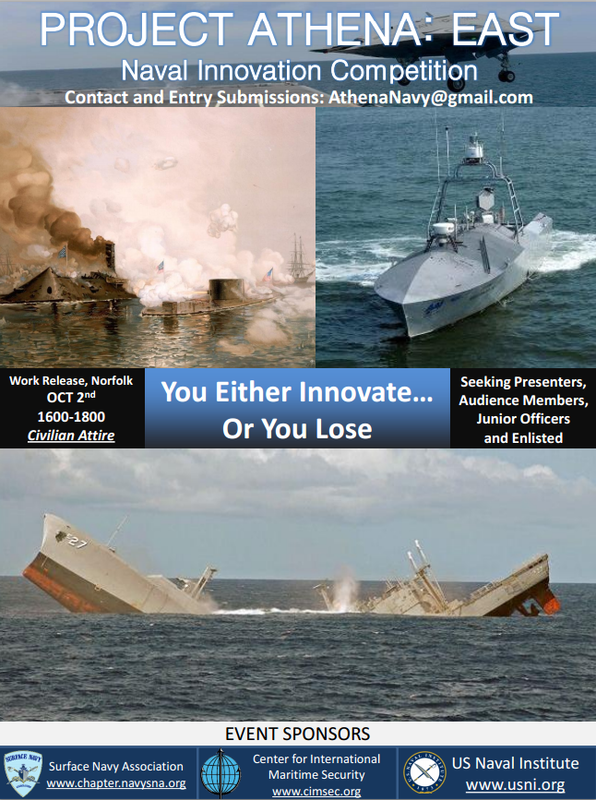 Our board covers ship to shore naval leadership, figures of authority disposed to innovation who are looking to both provide guidance, and find ideas from presenters that are applicable and workable to their organizations. There may well be others in the audience seeking good ideas as well. Ground Rules: NO “death by PowerPoint” eye-charts or lists – use of PowerPoint is limited solely to pictures to provide a picture of an invention or concept demonstration. Demonstrators are also encouraged to get creative, whatever that might entail. All told, presentations are limited to 5 minutes, with 5 minutes following of questions from the board, and 5 minutes of audience questions. It’s important to remember: innovation isn’t just fun, it’s a mission requirement. This is a fantastic opportunity to break away from the daily grind – to grapple with some of the more fun aspects of the maritime profession: looking forward to the possible. Hell, even more than the ideas presented, we can enjoy the discussion had between enthusiastic and different-minded naval professionals over a beer. Work Release will be offering Happy Hour prices on food and some drinks – so bring your appetite. 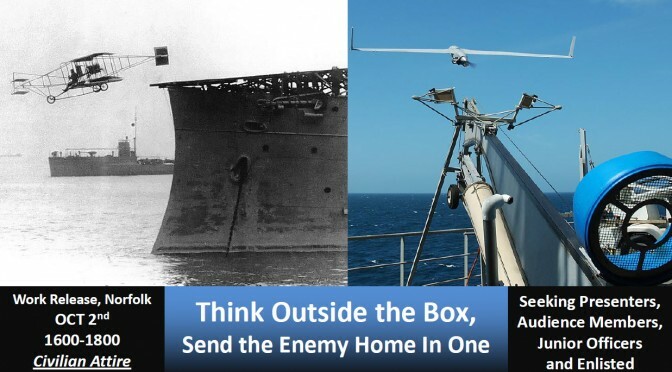 As part of our continuing Innovation Week (or two weeks – call it innovation), we will be posting the contestant pieces from the DEF Innovation Contest. Originally posted at the DEF Website. On Sunday, 26 October, the Defense Entrepreneurs Forum hosted an innovation competition sponsored by the United States Naval Institute. $5,000 in prizes were awarded after the eight contestants made their pitches. We will feature the one-pagers from the competition over the next 8 days. The following contribution is from Josh Steinman, a US Naval Officer. Software is increasingly becoming the defining mechanism by which the Army, Navy, Air Force and Marine Corps achieve tactical, operational, and strategic decision dominance. Previously the Department of Defense had achieved this ability through industry. As software takes on increasingly prominent roles in the Department of Defense, we will need to establish closer relations with the industry that builds it, much like the Department of Defense built long-standing ties to the industrial base during the pre-War, inter-War, and post-War periods of the early 20th century. These close links will ensure that the DoD retains the ability to rapidly integrate cutting edge digital technologies into our operations, as well as influence their development at all stages. a. Ensure continuity of action before, during, and after senior officer and civilian visits with entities in the non-Defense technology sector. Achieve this by acting as travel agent for senior officials before they depart (coordinating visits with local technology companies), local guide upon arrival, note-taker and action officer while engaged on the ground, and execution agent upon the senior’s departure. b. 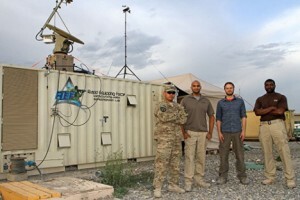 Identify early-stage ventures with potential DOD applicability and connect them with appropriate resources to utilize their technology for DOD purposes. Interface with DOD and service-centric early-stage and midstage venture capital firms, and liaison with entities such as DARPA, IARPA, US Army REF, CNO’s Rapid Innovation Cell, and OSD RTTO. c. Educate students, entrepreneurs, academics, and venture capitalists on DOD challenges and process with an eye towards changing attitudes towards the DOD. This would include conducting “presence missions” at regular events like SXSW, TECHCRUNCH DISRUPT, and even Burning Man. My proposed first step is to send an exploratory detachment of 3-5 officers out to Silicon Valley for a one-month site survey mission that would result in a full proposal white-paper, to be submitted to the Joint Chiefs of Staff within 90 days of their return. Costs for such a survey are on the order of $6,000 per person, for one month.